I am a resident and homeowner in the Parkside subdivision of Mountain Shadows. My house was lost in the Waldo Canyon Fire. Dealing with the initial loss of my home and personal property was difficult, but I have moved beyond that. I�m ready to begin the next phase of this process which is rebuilding. However, my hope of completing this in a reasonable amount of time is fading with each day that passes. Please understand that I was able to work quickly and efficiently with my homeowner�s insurance company to receive a reasonable settlement in a reasonable amount of time. I�ve picked out some ideas for floor plans and exterior design for the rebuild, have begun talking with a local homebuilder, and have worked out most of the financing details. So, what�s remaining to hold up the rest of the process? There is a seemingly unending number of roadblocks put up by my neighborhood�s HOA and the City of Colorado Springs. A few weeks ago, I had assumed that since I owned the property outright and it had been previously built on, that I would be able to build a house soon as long as I passed the architectural control committee review from our neighborhood. Since then, I�ve learned that I was a bit naive to think it would be that simple. Seemingly, each day I hear something either via the local media or from updates from our HOA president that make the possibility of rebuilding more and more distant. The first roadblock is our Parkside HOA. Up until this incident, I�ve been a very happy member of the HOA, but my opinion on it is changing quickly. The latest update from the HOA president indicates there are thoughts of limiting the selection of builders and allowed floor plans in the neighborhood. I�m no lawyer, but my reading of the incorporation articles leads me to believe there can be no such restrictions placed on those of us who are rebuilding on our existing lots. I agree that the exterior architecture can be controlled to be harmonious with the rest of the neighborhood, and I�m more than willing to cooperate on that point, but I�d like to have my choice of builder and interior design of my house. The Denver Post recently reported that ideas are being thrown around to include a governing body over Mountain Shadows that has the ability to enforce covenants and levy taxes. I�m absolutely against such an idea, and I expect most of my neighbors are as well. First of all, the covenants within Parkside are already strong enough, I do not see any need for another layer of bureaucracy to review rebuilding plans or any future changes to the property. Second, there just is not time to institute something like this. Those of us that want to rebuild would like to do so as soon as possible (Likewise, our insurance companies which are paying for our current temporary living arrangements would agree). The next roadblock that has been thrown up recently is the fact that the city is considering additional restrictions on what building materials may be used and possible changes to allowed setbacks to property lines. I realize that it is wise to have fire-hardened homes in the wildland-urban interface that includes the Parkside neighborhood. However, the time to enact rules for this was years ago. At the very least, the city needs to give a timeline when new rules may be adopted and some clues on what they might be so plans can be adjusted accordingly. Being a responsible homeowner, I plan to rebuild with class A fire rated roofing material, fiber cement siding, and composite decking material. I expect the majority of my neighbors will do the same on their own volition. In any case, I�ve known and accepted that wildfire was always a danger in this area of the city and realize that there�s no realistic way to make a home 100% fire resistant. I�m sure all Parkside residents would love to hear a clarification on the city�s stance with regard to possible changes in setback rules for rebuilding. As you may know, Parkside is fairly densely built up and the size and shapes of the lots allow for very limited configurations for homes to be built. There are rumors that some lots may become unbuildable or their value severely diminished. What is the plan with respect to this? Can I safely assume that I can rebuild in the same footprint of my previous house? Rebuilding is becoming unnecessarily difficult and drawn out because of the reasons I�ve listed. I�m ready to get back into my own home and get my regular life back. Many things in my life are on hold right now because of all this uncertainty regarding the rebuild, and I imagine that there are others in even more urgent situations that myself. I think the city and the Parkside HOA should trust that we are all responsible adults and can make the right decisions when rebuilding our homes. The speed at which the City initially responded to this emergency was amazing, and I was impressed by the rapid communication during the height of the fire activity. I hope that the city can continue to act with urgency as we attempt to rebuild our neighborhood. 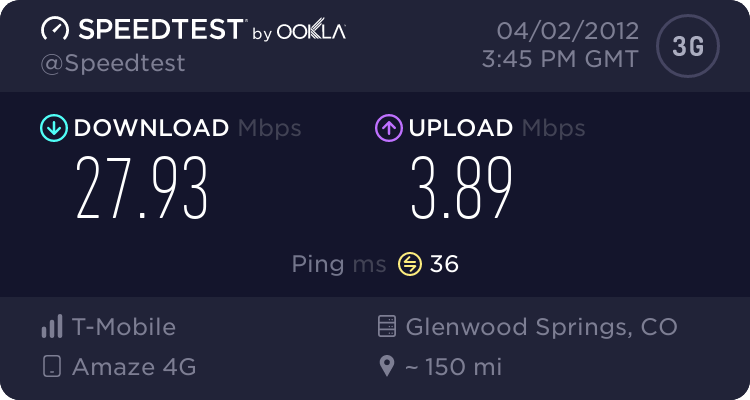 Why is my cell phone data connection, which I pay about $10/month for about 3 times faster than my cable modem at home, which I pay about $55/month for? I am very happy that I recently switch back to T-Mobile after a three year hiatus to the AT&T network. I originally switched because AT&T covered my neighborhood in 3G, whereas T-Mobile had no plan to do so.� It seems though, that T-Mobile has caught up and surpassed AT&T in this region of Colorado Springs, though.� I used to miss about half of my incoming calls at home and at work because they'd never ring. Then about half the calls that did go through would get dropped or garbled at some point.� I had three different phones that were compatible with AT&T's network and they all did this! I called and complained all the time and used AT&T's stupid app for reporting dropped or non-connected calls.� All they had to do was give me a free microcell and I would have stayed! But, now I'm back with my first-ever cell provider and I'm very happy. I switched in early March, and I've had exactly one call drop since then. Calls don't drop at my house, calls don't drop at work (even in the lab), calls don't drop along 30th street, calls don't drop on Centennial Ave. So far Ute Pass is really the only place I've noticed a lack of coverage, but that's difficult for all carriers since it's a deep, winding canyon. I probably won't die in my sleep any time soon!